We are passionate about connecting with our community which is a part of our missional focus. We can’t do everything however we aim to serve our community in every way we can. The Grain Shed is a place to belong. We are a family and value the importance of relationships and belonging. A journey as a follower of Christ is never stagnant. Restoration into the person we were created to be is a lifelong process, as is discipleship. At the Grain Shed we believe that transformation often happens in community, therefore we see opportunities to gather together as an essential part of this journey. We believe that the Bible is uniquely God inspired, and therefore is true and without error and is the sole and final authority for all matters of faith and living. We believe that humanity is created in the image of God but has fallen from original perfection, as recorded in Genesis, and as a result we are incapable of finding our own way back to God. We believe that as sinful people we need saving and because God loves us He desires to save us and forgive us. We believe that God does this by an act of undeserved love to all who are willing to return to a relationship with Him through faith and repentance. We believe that Jesus Christ is the Son of God who was conceived of the Holy Spirit and born of the Virgin Mary. We believe that Jesus died for our sins and was buried and rose again on the third day and appeared personally to His disciples after His resurrection. We believe that the Holy Spirit changes lives and produces a life in which believers grow in their faith, live for God and exemplify the life of Jesus. We believe that those who trust in Jesus as their Saviour and Lord will one day live forever in His presence in heaven. During the early 1900’s, a few loyal Christians began holding meetings in a private home in Swan Hill. On June 17th, 1910, a meeting of this group was convened to consider forming a Church of Christ in Swan Hill. The meeting unanimously agreed and on July 5th, 1910, the first communion service was held. In coming years, the Mystic Park, Ultima and the Woorinen Churches of Christ were established. The Swan Hill Church bought a property in Rutherford Street where the first church building was constructed and opened on 18 December 1910. In 1925 a decision was made to purchase land on the corner of Beveridge and McCrae streets (currently Best and Less site) and the old building relocated. This building and site served the church until a new brick chapel was constructed and opened on 8 April 1961. One by one, the outlying churches closed and memberships were transferred into the Swan Hill church. This process finished when the Woorinen church closed in 1981. With continual growth, the necessity to consider relocating again began to dawn on the leaders in the early 1980’s. By 1986 a visionary decision was minuted at the leaders meeting that the church would relocate from the Beveridge street site to another larger property within 10 years. The current site was considered in 1986 but no action was taken. However in March 2002 the “Grain Shed’ was purchased for the purpose of development into a multi-purpose community facility. This development was completed in 2006 and the ‘Grain Shed’ was officially opened on 23rd April that year. 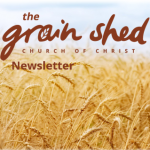 From 2006 till present the Grain Shed facility has been utilized by both the church family and the wider community as a place of worship, fellowship and celebration of love and life. 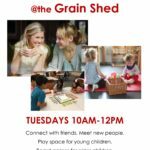 The leaders of the church believe that the Grain Shed will continue to serve the community in years to come.